“Stadsregio Amsterdam” is the name of the Metropolitan region of Amsterdam, a cooperation of 16 municipalities in the Amsterdam agglomeration. It has a population (2013) of 1.465.478 inhabitants (Amsterdam: 811.185) on a territory of 1.004 km² (Amsterdam: 219 km²). The number of jobs in the region is 898.330. 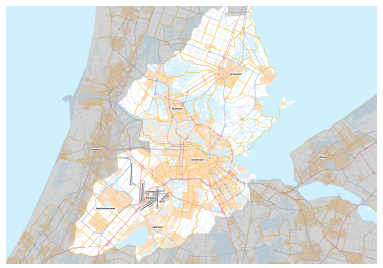 Stadsregio Amsterdam is one of two conurbations in the Netherlands with their own status and competence for public transport, alongside the 12 provinces. Furthermore the region is responsible for planning and financing of local and regional infrastructure for road traffic, road safety including cycling and urban (light)rail, housing, sustainable economic development and tourism. On the field of public transport Stadsregio performs studies on improvements and extensions of the transport network, network planning, procurement and contracting services with transport operators on services and public transport infrastructure investment. The Board of Executives sets fare policies for the public transport in the 4 concessions in the region. Defining midterm and long term policies on public transport a regional fare level policy.